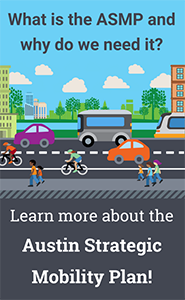 We started working on the Austin Strategic Mobility Plan (ASMP) in 2016. Keep reading to see what we’ve done and what we’ll be working on next. You can also learn more about the ASMP here. Para español, vea esta página de internet. During Phase I, we explored ways we have reached out to the community in the past. We looked at what we’ve learned through Mobility Talks and other plans. Connected with the community during events and activities. 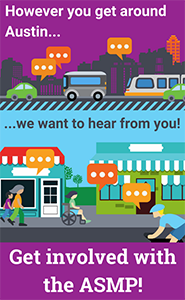 Asked community members to rank eight mobility goals for the ASMP to focus on. Started working with Capital Metro's Project Connect and co-created the Multimodal Community Advisory Committee. Co-hosted the first “Traffic Jam! A Mobility Solutions Workshop for Central Texans” event with Cap Metro. Based on what we heard during Phase I, we created three different transportation scenarios. These scenarios are starting points for what the ASMP will look like. Created an online and mail-in survey to get community feedback on our three scenarios. Met community members, leaders, and organizations through events and activities. Co-hosted the second Traffic Jam! event. Interested in learning more about our scenarios? See a scenario comparison chart or check out our more detailed comparison here. In Phase III, we shared draft policies and maps from the ASMP. The draft policies show important transportation priorities. The draft maps show Austin’s transportation vision for the next 20+ years. They also show current and potential mobility projects. Hosted ASMP “office hours” and participated in events and community conversations across Austin. Created an online survey and hosted focus groups to get feedback on the draft policies. Created an interactive online map that the community could weigh in on. Continued writing the final draft of the ASMP. In this phase, we shared the February 2019 draft of the plan with City boards and commissions and submitted it to City Council for review. On April 11, City Council unanimously adopted the ASMP. The adopted version of the plan includes the draft of the plan released in February 2019, staff-recommended amendments and Council amendments. What’s Next for the ASMP? Now that the plan has been adopted, staff are currently working to incorporate amendments into a final version to be published soon.